Next on the blog this week, a rare example of an early attempt at “on the spot” news. 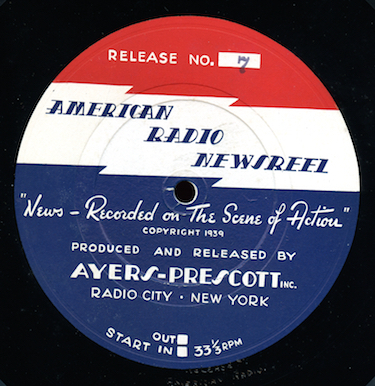 The “20th Century International Radio Newsreel” was a syndicated program. Only one example is listed in Goldin’s database, an audition with a sales messages for radio stations. The program of February 24, 1939 has reporter Michael Blair interviewing arriving passengers and celebrities from the Panama-Pacific Lines SS Washington at San Pedro harbor. Our program was transferred from a single-sided 16” Presto lacquer transcription. It appears to be a previously lost show. In this post, a historic broadcast that’s widely available, but we hear it dubbed from a line check done by a local station. From April 19, 1951, this is a full recording of General Douglas MacArthur’s farewell speech (aka the “Old Soldiers Never Die” speech) before a joint session of Congress. Truman relieved MacArthur of command a few days earlier and the speech was the centerpiece of much publicity when the General returned to the United States from Asia. You can read about the full controversy, including the debate about civilian control of the military, at Wikipedia. This recording includes only the introduction of MacArthur and the address with no commentary before or after. 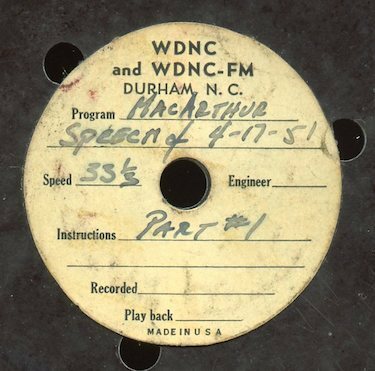 It was recorded on by station WDNC in Durham, NC, presumably so it could be rebroadcast later in the day or so they could play excerpts of it in their news programming. This is likely from the CBS feed of the speech, since WDNC was a CBS radio affiliate. The show was transferred from a three-sided 16” lacquer set from WDNC, Durham, NC. The fourth side of the set contains the April 23, 1951 broadcast of Grady Cole and the Johnson Family Singers, heard in another post on the blog. I’m not sure if this is any better or worse than other versions of the same broadcast that are floating around. Now, a relatively obscure documentary radio show. 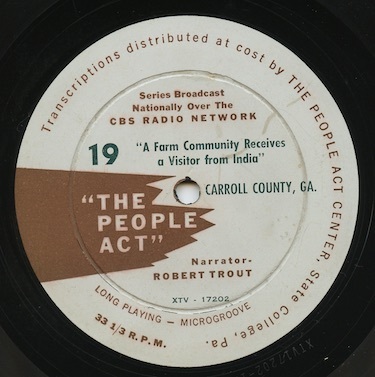 “The People Act”, produced by CBS and done in cooperation with the People Act Center, State College, Pennsylvania, was one of the first documentary series recorded in the field on tape. Each episode looks at how a local community deals with a particular problem in their area. 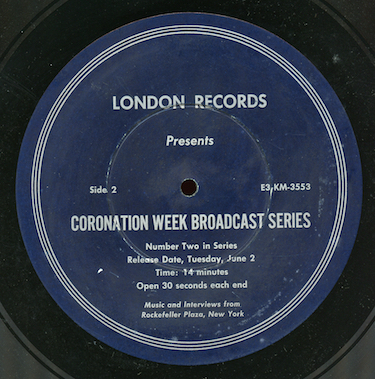 The 19th show in the series was heard May 11, 1952. Robert Trout narrates the story of a young farmer from India visiting Carroll County, Georgia as part of an exchange program. It’s fascinating to hear the clash of cultures and attempts at understanding between the local residents and the visitor, especially when it comes to food. The program was transferred from an original 12” microgroove vinyl record, matrix number XTV-17202, probably pressed by Columbia. The disc was either used to syndicate the program to radio stations at a later date or to distribute it to educational institutions. I have another episode from the series coming up in the blog soon. And here’s a final disc of time-shifted network programming from a collection of “throwaway” transcriptions from WHBC in Akron, Ohio. “Monday Morning Headlines” was an ABC radio network program, touting itself as giving you the headlines you would be reading about in the next morning’s papers. The program was sponsored by Airwick, “the little bottle with the magic wick”. Truman will sign the Republican sponsored anti-inflation bill tomorrow, despite his reservations about the bill. Maine senator encourages cooperation by Republicans and Democrats on legislation to fight inflation. British government has confirmed a trade agreement with the Russian government. An update on the Friendship Train. Italy’s former king, in exile in Egypt, has died in Egypt. The Manila typhoon is the worst in forty-two years. Flyers hope to rescue survivors from a B29 that crashed in Alaska. Burma is becoming independent from Britain. The editor of the “New Republic” has resigned because of the political ambitions of Henry Wallace. 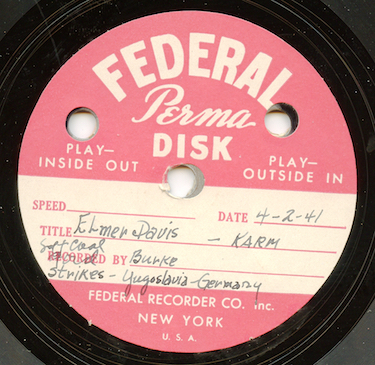 The program was transferred from an original sixteen inch Audiodisc lacquer recorded at WHBC, Akron. I haven't found any other examples of this series, but some may be floating around out there. My apologies for the rough sound on this disc. Now we kick off the final posts on the blog before we go on hiatus again. Here’s our final episode of the obscure pre-War Ayers-Prescott syndicated news series, “American Radio Newsreel”. Program 8 in the series probably dates from January or February 1940 and appears to be previously lost. The head of the French Bureau of Information gives his opinion on the war in Europe, the Russian-German pact, and the mistakes of 1918. A former Nazi propaganda official, Hitler’s press secretary, is interviewed about Hitler. Benny Friedman, coach at New York City College, gives tips to football hopefuls and gives his opinion on schools funding football players. Paul Robeson is interviewed about a new play about folk hero John Henry that is headed for Broadway. The “Woman’s Page” talks with twin women about returning from a sheik’s harem in Iraq. Our program was transferred from an original sixteen inch Ayers-Prescott shellac transcription. And here’s a final disc of time-shifted network programming from a collection of “throwaway” discs from WHBC in Akron, Ohio, a news broadcast from columnist Drew Pearson. In the program of January 4, 1948, Drew Pearson is heard via shortwave transcription from Milan, Italy, where he is traveling with the Friendship Train. The show was broadcast on ABC and is sponsored by Lee Hats. Pearson reports that Russia has sent fighter planes to Albania to help the Communist army in Greece and is concentrating more former Nazi POWs in Belgrade to help with the effort in Greece. The Italian crew of the Friendship Train has threatened to go on strike at Bologna because they didn’t want to switch crews. Franco is concerned about trouble in Spain this winter. Pearson describes the reception of the Friendship Train in Rome, Florence, and Bologna. The Communist mayor of Bologna refused to meet the train because of reports about him by Pearson. In the last segment of the program, Pearson gives some of his famous predictions. The first is that a bill requiring Senators and Congressmen to register their securities with the SEC will be introduced in the next session of Congress and will be killed in committee by two Republicans. Pearson predicts revolution in Italy, due to the presence of Tito’s Communist forces poised on the Italian border, but that it will not succeed. Pearson encourages Americans to help the fight against Communism by writing to their relatives abroad to dispel the lies being spread about America in Europe. The Friendship Train was an unusual project that Drew Pearson advocated. The Train was packed with food and supplies from different states as a gift to war-torn Europe. In return, the Europeans sent gifts back to the states. There are still some museums in different states that display these gifts. You can see a short Pathe newsreel clip of the Freedom Train in Italy, taken during the period when our radio broadcast was originally recorded. This appears to be a previously lost episode of Drew Pearson’s series; Goldin lists thirty that surive from his long-running series. The program was transferred from an original sixteen inch Audiodisc lacquer recorded at WHBC, Akron. 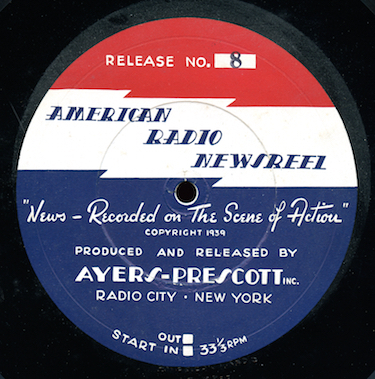 We continue our look at the obscure pre-War syndicated series “American Radio Newsreel” with a previously lost episode. Program 7 probably dates to January or February 1940. Delores Laurell recounts her harrowing escape from Poland as it fell to the Nazis. Jack Dempsy discusses fighters, past and present. Edith Rogers Dahl fights for her release of her husband from a Spanish prison. Then we go to Hollywood for short interviews with actors and actresses, including Claire Trevor, Adrian Aimes, Eddie Lowe, and Beverly Roberts. Finally, the editor of the Pathe News is interviewed about how he gets his war pictures. 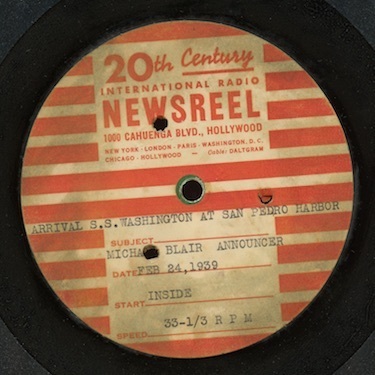 Now, let’s hear another episode of the unusual series, “American Radio Newsreel”. The program was recorded on location each week and quickly edited and pressed up for syndication to local stations by Ayer-Prescott. Program 5 in the series is dated to December 1939 by Goldin. Stories include an interview with the captain and radio operator of a US vessel sailing for Norway to test neutrality law and another with the “only white rani in the world”, Viner Brooke. Then we hear Otis Skinner and Martha Raye. The announcers are James Cleminger and Alan Barnes. The show was transferred from a sixteen inch one-sided shellac transcription. There is no matrix number.